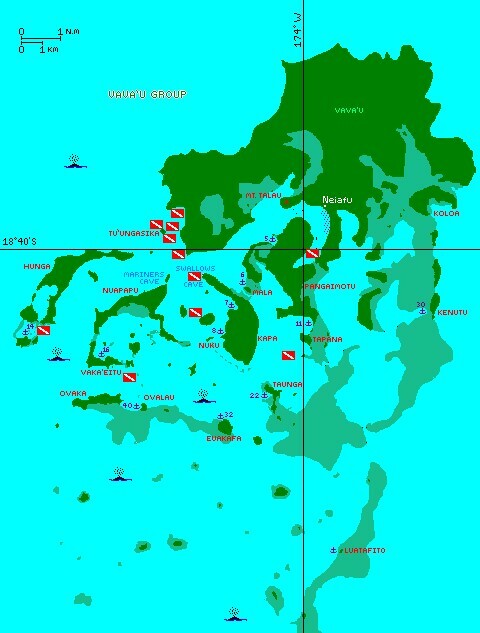 The Vava'u Group of Tonga, showing our anchorages and dive sites. Click on a dive flag to go to our description of that dive. 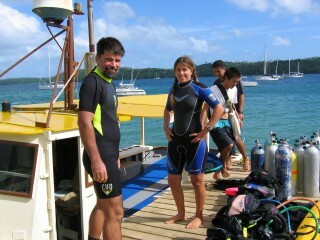 There are currently only 2 dive shops in the Vava'u Group of Tonga, both in Neiafu (the only town of any consequence). Of these, Dolphin Pacific Diving became our favorite because we liked the instructors, Kevin & Joe, and they liked to hold "Club Dives" every month. These were open to anyone who lived in Vava'u, as well as to cruisers who were staying for about 3 months. Dolphin would supply everything (except food) for 2 dives, including their dive boat, for only about US$15 per person, well below the normal price of about $50. Surprisingly few cruisers (or locals) took advantage of these wonderful bargains, but we went every time we could, bringing a picnic lunch to share with Kevin or Joe, the kiwi divemasters. Kevin and Joe were great, showing us lots of features, swim-throughs, and interesting flora and fauna that we never would have found on our own. 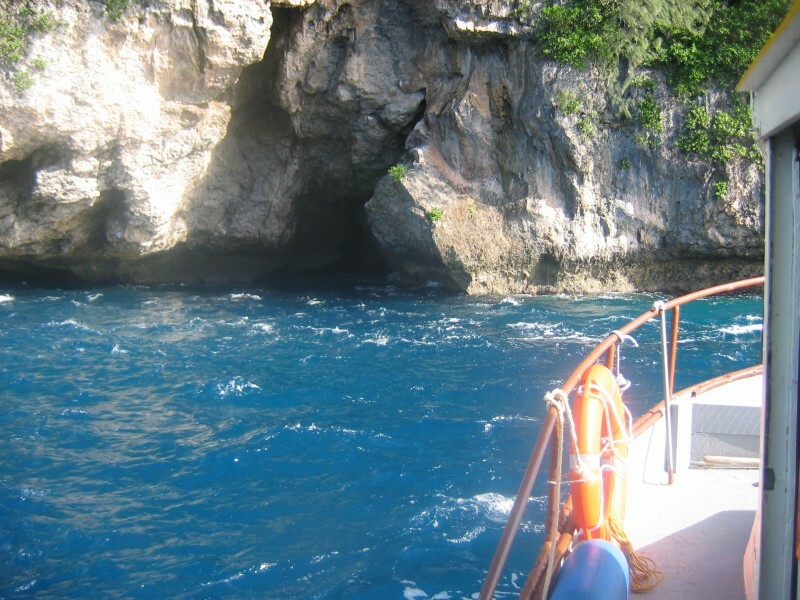 These club dives usually went to sites near the NW entrance to Neiafu: Kimmie's Reef, Boulder Bay, Mushrooms, Split Rock, Sea-Fans Grotto, and Swallows Cave. Dives we went to on our own, or with other cruisers, include: the Clan MacWilliam wreck, Tapana Bommie, Vaka'eitu Bommie, Blue Lagoon, and Ava Island. Positions: We've now added latitude and longitude positions to our dive tables. We did not take a GPS with us - these positions were determined afterwards from our navigational charts. 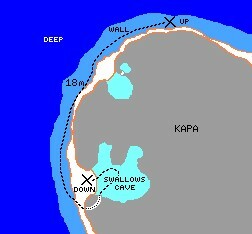 Positions in Tonga do NOT match the charts, as the charts appear to be shifted about ¼ mile (500m) WNW from where they're supposed to be. The positions we've listed are close to what a GPS should read, as we've subtracted 0.2 miles of longitude from what our charts say. Nevertheless, they should not be depended on too much. There are a few dives we haven't bothered to put in here. For instance, Jon and Chris did a dive to clean up the Neiafu Harbor, helping to collect over a ton of refuse off the bottom. Also, just before we left Tonga, Jon and Chris got their Advanced Diving certificate through Dolphin Pacific Diving. This involved a Navigation dive as well as a Search & Recovery dive, both in the muddy shallows off the Dolphin Pacific Dive dock in Neiafu. (Jon) I actually did this dive twice, first as part of a club-dive and then again as the deep-water component of my Advanced Open-water certificate, which involved sitting on the bottom in 93' (28m) and performing mental tasks (like spelling our names backwards) to see how nitrogen narcosis could affect one's ability to think. Both dives were through Dolphin Diving. 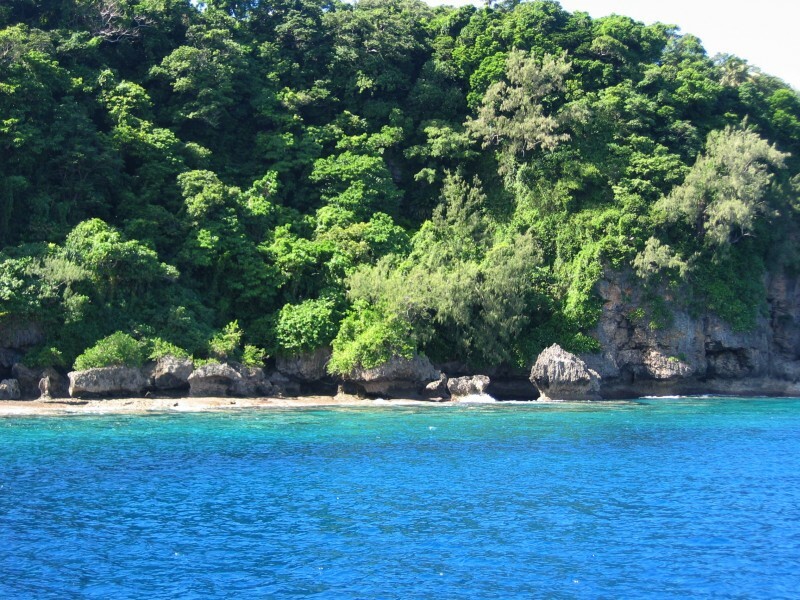 We splashed initially into 25' (8m) and immediately swam down a narrow gully with corals on both sides. Joe took us through a number of "swim-throughs" - not quite caves, but narrow cracks we could just swim through. These were generally open at the top, but while our air bubbles could get out that way, swimmers could not. While these swim-throughs were fun, they were barren of life. Sometimes I enjoyed swimming above the group, outside the crack, watching the rich sea-life and the bubbles from the divers below escaping through the cracks. Swimming up the many canyons with corals on both sides was also a fun feature of these dives. (Chris) Like my dad, I did this dive twice (at the same times and for the same reasons). The fingers of coral and the swim-throughs were extremely cool; the maneuvering was sometimes tricky, but it felt like flying. There were actually a total of three swim-throughs, and while its true that they did not offer many photographic opportunities inside, there was no lack of pictures taken on either dive. 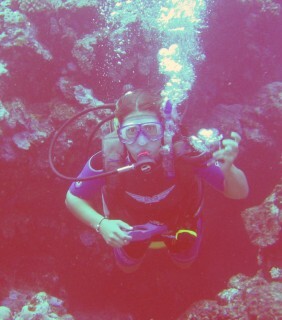 I was really surprised, when we did the deep adventure dive, just how much I was affected by the nitrogen. Writing my name backwards takes a little while anyhow (GNIKCAH REHPOTSIRHC is rather long) but it took a really shocking time underwater. Worse than the amount of time, however, was the fact that it didn't feel that long at all. In fact, I thought I was going rather quickly, compared to on the surface, and the thought that my time sense was that disturbed scared me. While deep diving, losing track of time is a very bad idea. (Sue) This was the first professionally guided dive I'd done in years and years, and I have mixed feelings about it. On the positive side, I could really relax about the safety: the guides chose a spot without difficult current, and they knew how to safely guide us through several swim-troughs (which we never would have tried without their guidance.) It was also nice to know that the big dive boat was hovering above us, and on the look-out for us. On the down side, we're more used to moving along at our own pace, stopping, probing, looking, meandering along. With the guide and small group of 6 divers we had to follow along, kind of like on a trail ride with horses! Despite the need to keep moving, I loved following the contours of coral-bedecked canyons, and exploring the insides of swim-throughs, which were pretty barren but geologically interesting. It was fun to return here a couple months later and do this dive again, this time with a smaller group. On the repeat dive Amanda and I had more time to really look around and not be so concerned about sticking with the group. I even chose to swim above the swim-throughs and get pictures of Amanda emerging. (Amanda) This was the first dive I did in Tonga, and it was really cool... except when I jumped in and Chris immediately said "Hey, there's a sea-snake behind you!" and then a few seconds later, Dad asked "Did something hit your knee?" I never did actually see the dratted thing! 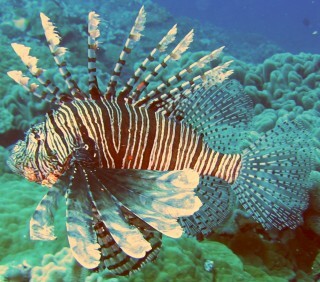 We often saw Lionfish on the Tongan reefs. The spines are poisonous & quite dangerous. (Jon) This was another of Dolphin Diving's great Club-Dives, off Tu'ungasika Island at the NW entrance to the Vava'u Group (map). 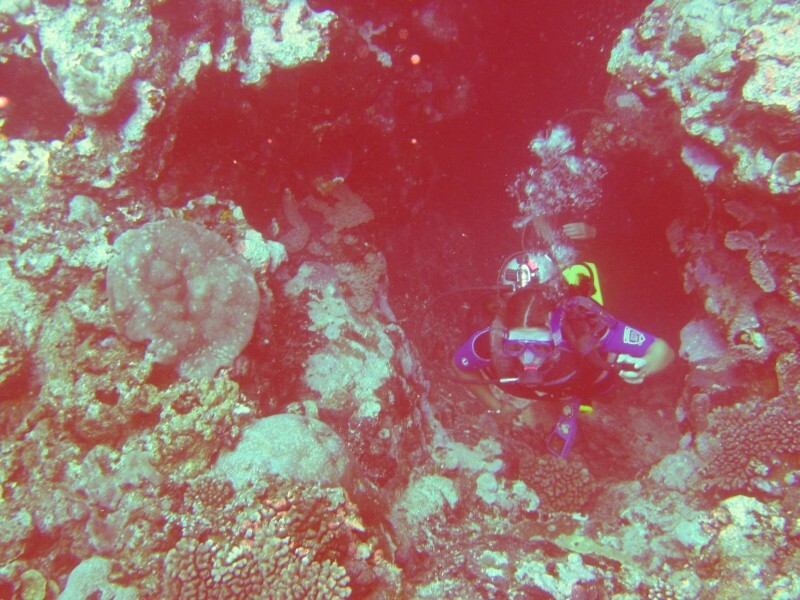 Again, Joe gave us a wonderful tour, taking us first down a steep gorge, under a huge rock, around the top of a bommie rising out of the depths, back under the huge rock, and across a vast coral plain with a huge dark-red sea anemone. But my favorite part of the dive was near the end, when I found a huge (and very poisonous) Lion-fish, perhaps 20" (50cm) long. Most of the Lion-fish we'd seen before were only half that length. Lion-fish have long, poisonous spines and usually hide under rocks and overhangs, but this one was swimming slowly about 15' (5m) off the bottom. This allowed me to to get some great photos from underneath, without much background to distract the eye. Very cool! Limestone cliffs above Kimmie's Reef. These types of formations are common in Tonga's Vava'u Group. (Chris) For sheer beauty of the coral gardens, I think this dive takes the cake in Tonga, perhaps in all the Pacific dives I've done (though I haven't actually dove on the Great Barrier yet, and my snorkeling memories are that it was really lovely). As advertised (by Dolphin Diving), there was almost no dead coral and the reef stretched as far as the eye could see (which was pretty far, the visibility was good). Overall, I thought this was one of the nicer dives: not too deep, good visibility, excellent reef, lots of fish (including two of my best ever lionfish sightings), and interesting terrain (I really do love the 'flying over the landscape' feeling, even though I can't go very fast with a tank on my back). We did a different profile on the second dive, and while I might have liked the first dive profile a bit better, I thought that I could have done this dive any number of times, and enjoyed every one. (Sue) I got to do this dive twice as a Club Dive: once with the whole family and once with just Chris. I really enjoy following along behind him as he does his underwater thing. It lets me go slowly and really get into seeing the reef fish and reef life. The first visit was the better one, because we had an experienced guide (Joe) whereas the second time we were with a new guide who was too timid to let us pair off and continue swimming if one of the group of 6 had to surface -- which was the case as one young diver had trouble equalizing, and Peter, our cruising friend on Cookie Cutter, had a leaking BC and had to ascend early. The coral here is fabulous, and the swim-throughs are fun, but we didn't get to do any on the second dive as our inexperienced guide didn't know where they were or didn't want to take us through (which was just as well with the ear and BC problems!) The BIG red anemone we saw on the first dive (at about 25 meters) was AWESOME and I was sorry not to see it the second time. (Amanda) Even though I wore a shorty-wetsuit, I really noticed during this dive how cold the water is in Tonga - immediately after the dive I went and huddled in the sun on the down-wind side of the boat! Man, it was cold! But enough of that. Kimmie's reef is really just that - a reef. Unlike a bunch of other dives we did, it's just a flat plain sloping gently down into the Deep. I'm not complaining, however, because the coral is just magnificent. 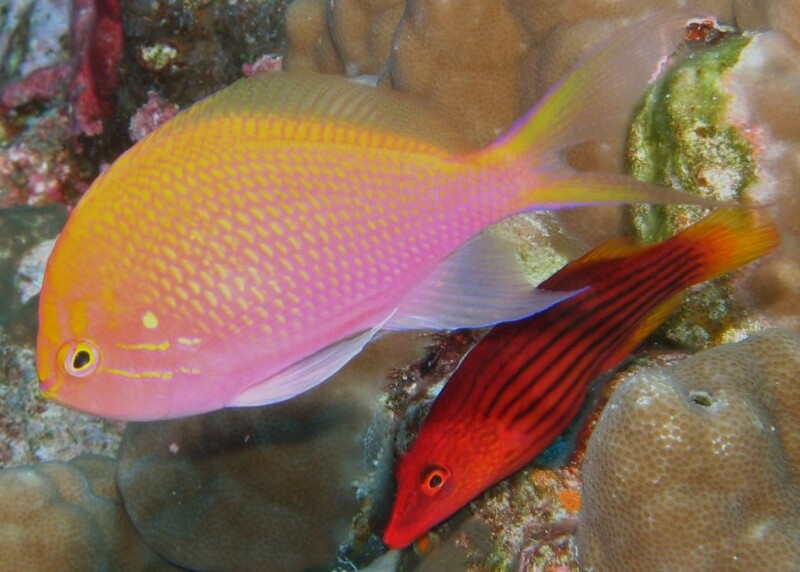 Maybe my visions of the Tuamotus were fading, but it sure seemed wonderful. Another thing was the visibility! This being the second dive of the day, we only went to about 55-60 ft, but I kept looking over my head to see how far away the surface was! I could almost see the light dancing on the bottom from the waves... okay that's fantasizing a bit. I guess it was just the big (huge!) red anemone flapping and undulating in the surge - not that there was much. 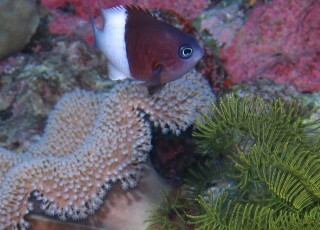 That anemone was so big, and just teeming with anemonefish. No clown-fish yet, they're further west (I keep lookin' for Nemo!) 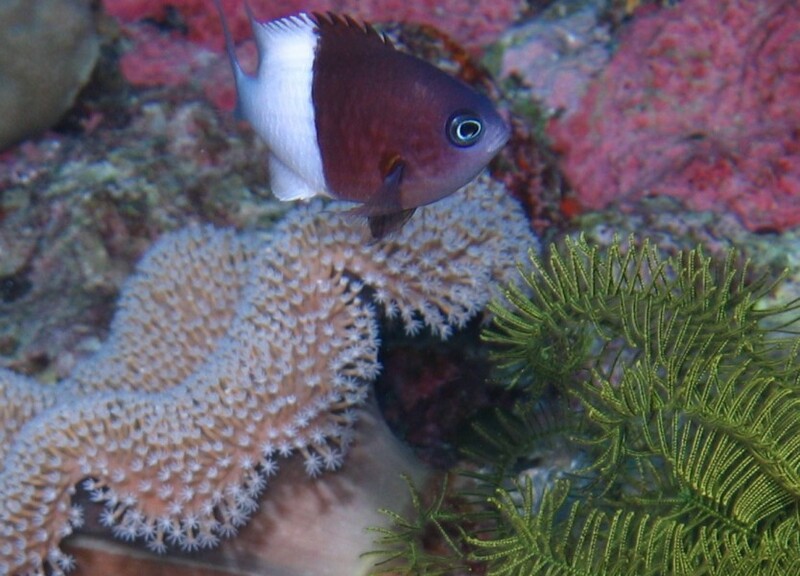 but some Pink and Red & Black anemonefish. Lots of them, which was a bit interesting because I had been of the impression that a few fish "claim" an anemone, and keep everyone else off. I guess it was so big they could afford a few friends to come along, too. Dive Profile: We don't have a schema or this dive, as it basically followed the shoreline, taking you in and out of canyons and around towering rock formations. 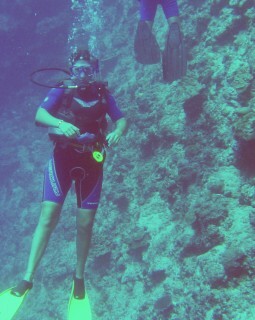 (Jon) I did this dive as a night-dive, part of my Advanced Scuba certificate through Dolphin Diving. While I liked swimming at night in our pool as a kid, I've never been very fond of swimming in the ocean at night. Evening is when sharks like to feed, I can't see the colorful fish I like, and I'll admit to a bit of claustrophobia from the lack of visibility. But Dolphin provided some spotlights, and there was a herd of Kiwis diving the site at the same time. All the lights made me feel better and lit up the area like a fairyland (sort of like skiing at night). In theory, diving at night lets you see creatures that only come out then, so I had something to look forward to. 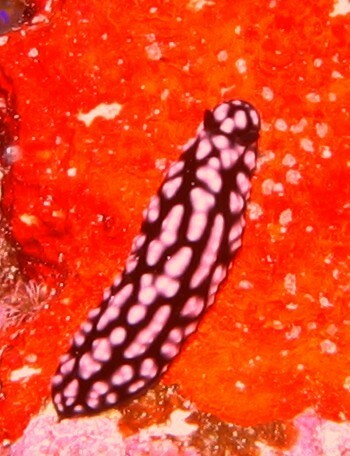 The funniest new creature was the Spanish Dancer Nudibranch. While most nudibranchs are only an inch or 2 (2-5cm) long, these are the biggest in the world, sometimes growing up to 2' (60cm) in length. 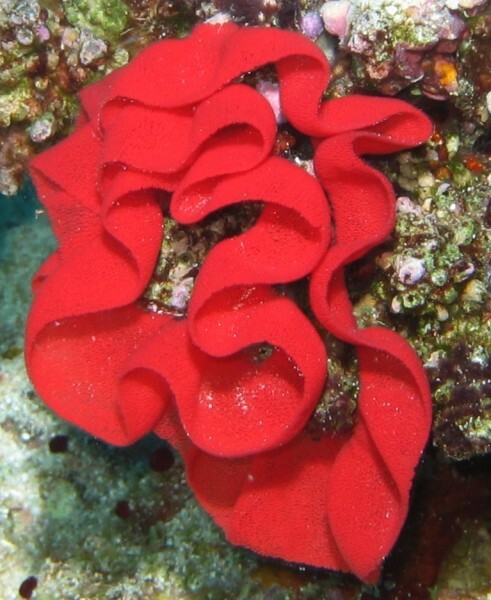 At first, they look a bit like bright-red sausages lying on the bottom, but if you tickle them, they sprout a lacy skirt of red and white around their whole body. Tickle them again and they try to "swim" by bending back and forth in the middle while waving their colorful skirt. While all this frenetic activity looks reminiscent of a Spanish Flamenco dancer, it actually does little to propel the nudibranch, so they're easy to follow. Unfortunately, the camera ran out of batteries (we'd dove Boulder Bay that afternoon) so we didn't get any pictures, but the colors in the spotlights seemed more brilliant than usual. We also saw some lobsters that we don't usually see in the daytime, as well as some sleeping parrot-fish (but they weren't in their cocoons that I could see). A surprisingly fun dive. (Chris) I did this dive twice, and thought it excellent both times (though for different reasons). The first trip (a club dive with my mom) went much like the other club dives, which was to say a lot of fun, dive-masters to guide us to all the great spots, etc. I thought the coral formations here were one of the coolest things about this dive; I got several shots, both wide-angle (though this is difficult in the low light underwater) and macro, of some very interesting corals. 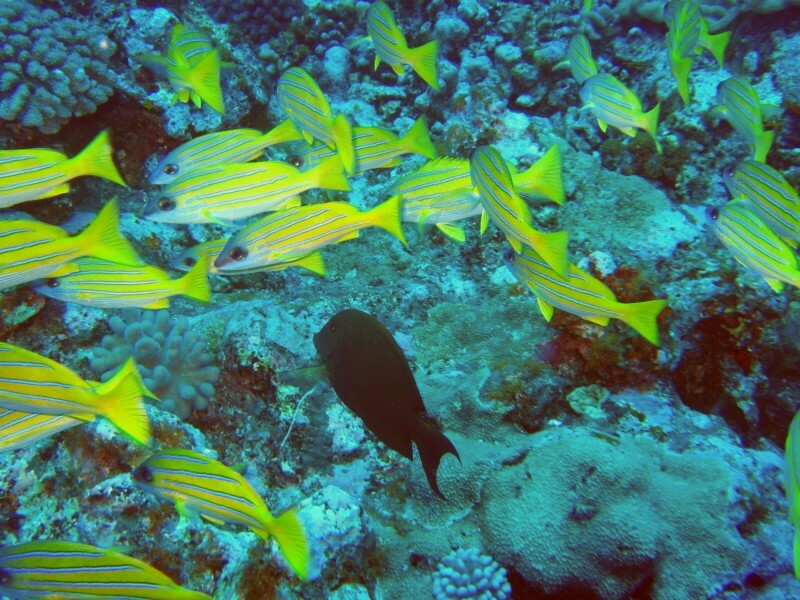 Not that the mobile life wasn't great too; I got lots of shots of fish and other reef creatures. The night adventure dive was the absolute coolest thing though. I want to say, right now, that I am sorry and I must have been a complete fool that day. I forgot to bring two sets of batteries for the camera, so after the deep adventure dive, I didn't have enough charge left for the night dive. 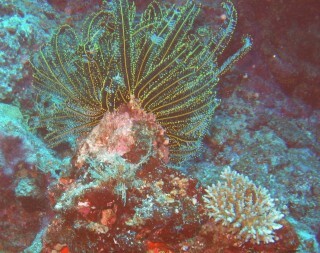 This was a REAL pity, because the reef is very different at night, and I saw creatures like nothing I'd ever seen before. For example, imagine a crab with long, spindly legs and pincers, rather large eyes on antennae, and a carapace literally COVERED in sea anemones! No joke at all... I learned later that these crabs are completely nocturnal, spending the day with all edible bits hidden under their shell, which is invisible beneath an apparently completely normal (not to mention stinging and potentially dangerous) cluster of anemones. I saw two different kinds of lobsters, many varieties of crab (both with and without anemones), extended coral polyps, sleeping fish, some nocturnal fish which must be hidden during the day, and, of course, Spanish Dancer nudibranchs. My light started running out towards the end of the dive, but we had several so it was no problem. 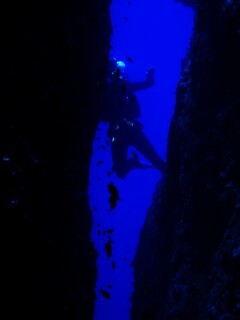 At full power, the lights are amazingly bright; two-way visibility (the distance where light will reflect off something bright enough to be seen) is less than in good daylight, but another diver's light can be seen at a great distance, and up close, the beam provides better light than the sun because it hasn't been diffused and washed blue by passing through a lot of water. I would absolutely LOVE to go on another night dive (I'll remember the camera batteries next time) but I think the best way to do it is with a divemaster who knows the dive well; I could've gotten quite lost down there. The teardrop butterfly-fish is very distinctive! (Sue) This was a very intriguing dive following the shore contours. At first glance it appeared pretty barren, with lots of "gravel" between rock formations. Bu up close there was lots of life. Many crinoids (sea feathers), pyramid butterflyfish, parrot fish, and a big lion fish. Peter (from Cookie Cutter) saw and photographed a big moray which I had inadvertently pointed to. The rock formations were reminiscent of the SW US -- huge rock formations, some jagged with peek-a-views, others rounded. There were valleys and drop-offs. 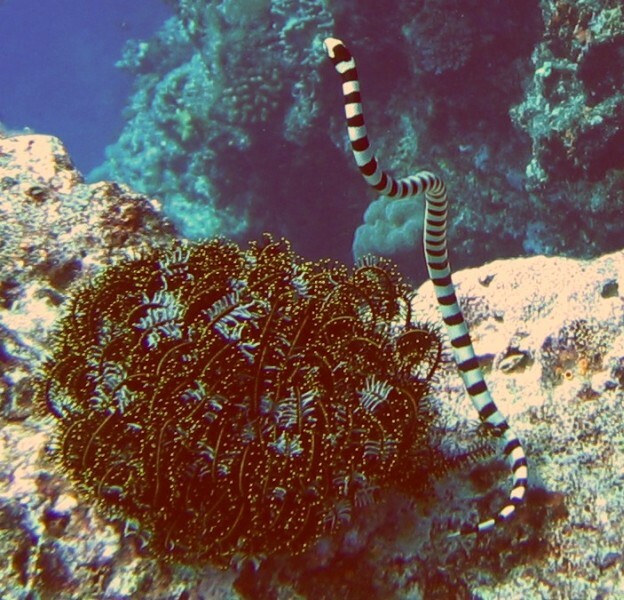 I enjoyed the barren spaces because it allowed me to relax and look around and investigate interesting clumps of coral without worrying abut bumping others. I was buddies with Chris and liked the slow pace of accompanying the photographer. 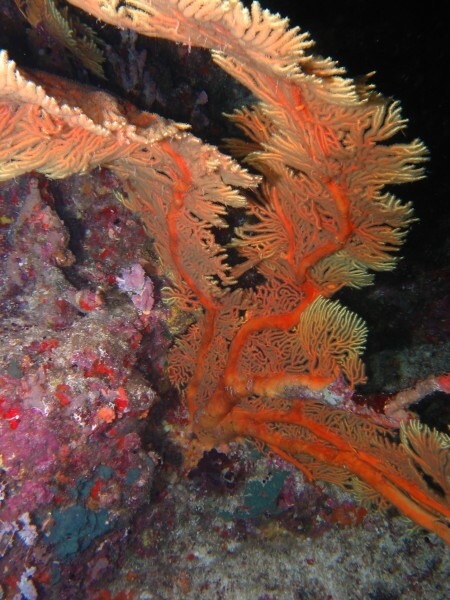 There were lots of encrusting "table cloth" corals draped over boulders. A really nice dive. There was actually a rather convoluted dive profile for Split Rock. We descended nowhere near it, then followed the coast of Tu'ungasika a ways, ducking into caves and through a few canyons and swim-throughs. Split rock was only at the very end of the dive, as it was very convenient for our safety-stop. Or it would have been, if the tide hadn't been ebbing rather rapidly. It probably would have made a rather interesting picture from the surface - about seven divers clinging onto whatever dead patches of coral they could find, the rest of their bodies streaming out in the current, kicking softly to keep the strain off their arms. But it wasn't until this point that I actually realized we were on top of Split Rock. It wasn't quite as wide as I thought it would be; at the top of the rock, the gap was five, maybe six feet across. It was sealed pretty tight 40 ft down, meaning that anyone who got their picture taken had to stay pretty high up in the gap, otherwise they'd become slightly squished. (Sue) The four of us did this as a Club Dive with Dolphin Diving. We splashed off Philia into about 20' (6m), then descended into a gully and through an arch. We had some entertainment here, as "Ernie Dingo," a TV celebrity from Australia, was with us doing a tourism ad for Tonga. He wanted Maki, a lovely young Japanese traveler who we knew from shore, to "retrieve" from the ocean floor a "lost" bottle with a message in it for the film crew. 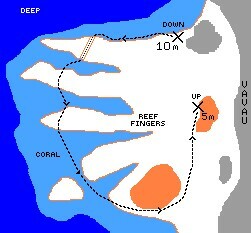 This being done, we followed some coral-dense canyons and swam around several bommies to come at last to Split Rock. While Jon and Chris swam through the cut and took photos Amanda and I circumnavigated several times. This would be a good snorkel, as the top of the split is in about 15 feet of clear water. (Jon) Split Rock is the classic Tongan dive - any dive publication on Tonga will mention it and show a picture of this huge rock split in half, usually with a diver posing in the crack. It was also the first of 2 dives we did this "Club-Dive" day. Because of meeting up with (cheeky, in an Australian way) Ernie Dingo and his entourage on a Sunsail charter-boat, we split up into 2 groups. We ended up in the second group, led by Maki a delightful young Japanese woman who is trying to break the traditional stereotype by traveling the world for 3.5 years by herself, following whales and dolphins. Being in the second group allowed us to take our time and play with the camera, which suited us fine. A fun dive! Nudibranch Phyllidellia pustulosa is an interesting Black with pink. 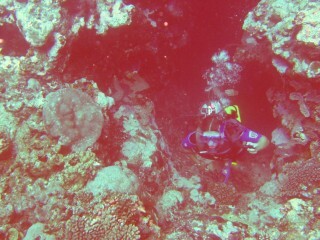 (Chris) This was another of my absolute favorite dives in Tonga. 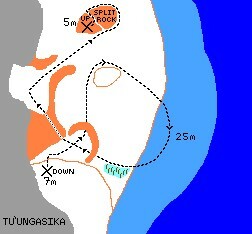 The first part of the dive, leading up to Split Rock itself, was nice, but nothing extraordinary. However, the rock was CERTAINLY quite spectacular. We spent a while just swimming around it, checking out the amazing reef growth (lost of soft corals) on the rock and inside the split. Fish swirled all around us, around the rock, through the slit, and on the small plateau on top. Regardless of what Amanda wrote, I think that Split Rock was one of the coolest geological features I've seen while diving. One can't actually see water (not while in it) anymore than air is visible on the surface. However, the interface between air and ocean is quite beautiful when viewed from below (though it doesn't tend to show up well in photos). Looking up through the split, seeing fish flash across that narrow 'V' of dancing light, was an astounding view. Perhaps the fish thought so too; I saw more there than I've seen on some entire dives. One other nice feature of the dive was that the top of Split Rock is about 20' deep, making the area just above it an excellent place to take a safely stop. 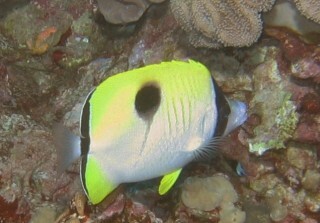 Instead of hovering, neutrally buoyant, in the middle of the ocean, with one eye on the depth gauge and the other on the watch, a diver here can swim around a small but very obvious landmark, observing fish and corals and taking pictures, for as long as they fancy while easily noting the correct depth based on the top of the rock. Of course, I was sorely tempted to follow a few fish down over the edge, but that really isn't the spirit of a safety stop. (Jon) This was our second dive of the day, another "Club Dive" with Dolphin Diving. The most striking feature of this dive for me was that we could hear whale-song the whole time! It was eerily beautiful to be swimming along and hearing their songs. I imagined them peacefully frolicking in the clear water, and wanted to frolic myself. 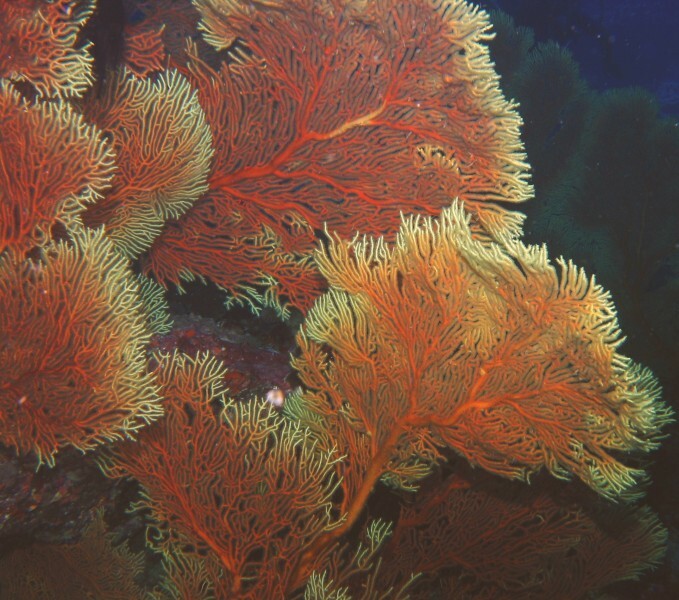 The other striking features of this dive were the sea-fans and the current. 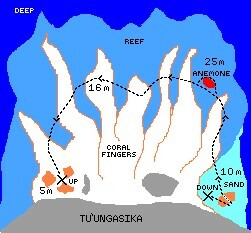 We splashed into 30' (9m) on the SE side of Tu'ungasika Island. The current was pretty strong in places. 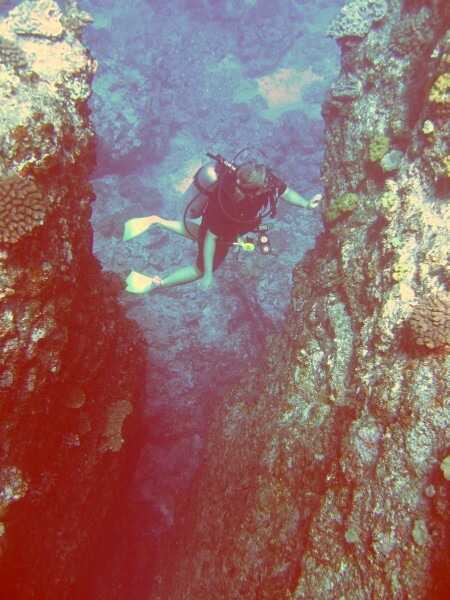 We dove down and under a huge arch, around a corner, and ran smack into a strong current. Others tried to swim through it, but I decided to preserve air and strength by crawling along the bottom - it was that strong. 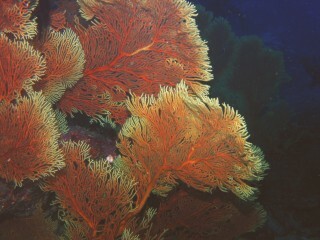 This was where the sea-fans were, waving in the current and absorbing nutrients. We then swam along the side of a beautiful, coral-encrusted wall that sloped gently down to "Narcosis Valley," so named because it's easy to get too deep and suffer from Nitrogen Narcosis - the "rapture of the deep" that causes divers to do really silly things underwater, as if they were drunk. The end of the dive was a huge cave that must have had a porous top, because our air bubbled did not accumulate there - they seeped through the apparently solid rock. We returned somewhat higher along our coral wall and took our safety stop on top of a coral outcropping, watching the small fish playing and listening to the whale-song. Delightful! (Chris) I really should have enjoyed this dive under less strenuous conditions; there was a lot to see in terns of coral and fish, seafans are gorgeous and rare down here, and the terrain was very interesting with its swim-throughs, valleys, caves (well, overhangs), and etc. However, in the ridiculous current (reminiscent of the drift dives in the Tuamotus) it was all I could do to keep in sight of the group. 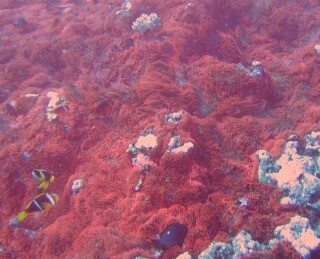 At the beginning of the dive, I did several stupid things, like taking off after fish with my camera. However, not only was it quite tricky to get a good shot, or even hold still (while the fish, of course, go basically wherever they please), as soon as I wanted to return to the group, I had a long and strenuous upstream swim to do. Eventually, I grabbed a chunk of dead coral and pulled myself along wherever I could find dead coral or bare rock to pull against; I had terrible trouble keeping up even so, and I couldn't spare any time or hands for the camera. After about 30 minutes, I looked at my console and got a serious shock: I must have been burning through my air dangerously quickly, and had perhaps ten minutes left. Normally, this wouldn't be a problem (disappointment, but not problem) but there was nowhere to do a safety stop, or even ascend slightly to use less air in each breath. We were 55' (17 m) down on a plain of coral under a deep canyon, and it was blasting a river of current at us; anybody who tried to swim straight up would probably have wound up 100' downstream going at a safe ascent rate, and something like a quarter mile if he or she took a safety stop. Okay, maybe I'm exaggerating, but then again, maybe not. There was a LOT of current! makes a nice backdrop to the bright fish! Eventually, I just worked my way up into the canyon, following the others (they had been somewhat ahead of me for a while). Unfortunately, I wound up on one side of the canyon and they on the other, and my side wasn't high enough for a really good safety stop (great planning, Chris!) but my air was running very low (as in, into the 500 psi reserve) and my buddy was too far ahead for me to reach. Instead, I braved the current to swim across to the other side, where another diver (not my buddy, but part of our group) was also low on air and doing a safety stop. He had enough for both of us to do our safety stop, however, so I used his alternate second stage (sometimes called an 'octopus', basically a second mouthpiece connected to their main tank that divers carry for just this need). We made it to the surface without drowning, passing out, running either tank completely empty (which is avoided because it might allow water into the tank), or getting decompression sickness. It was a pretty serious reality check for me, though; even on the smaller size tank (like I was using for this dive) I'd never had a critical-on-air emergency before. (Sue) I was glad to get a chance to do this dive, as I'd heard about it, but each time we'd tried to come here the current was too strong. Even this time there was enough outgoing current it was quite a feat to move along the bottom of the cavern and archway using finger tips on the rocky bottom to make headway. How beautiful to come round a corner into the min-forest of yellow, waving sea fans! Unfortunately we were still bucking current so it was difficult for Chris to get good pictures. From the sea fans we followed the contour of the island to the south (and up current), then drifted back down to the boat. Some divers saw a sea turtle. 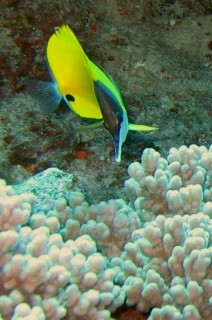 There were great anemones and anemone fish. In between breaths I heard a low haunting sound -- humpback whale song! (Amanda) This was an interesting dive, seeing as the current was very strong from the outgoing tide. I was one of the last off the boat, and made the mistake of not waiting for the driver to bring me back inside the cavern, where everyone else was waiting. It made for a long swim up-current. 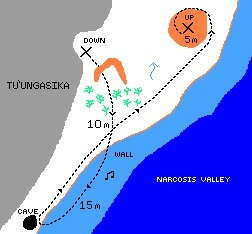 The dive continued along (and back along, when we turned around) a gently-sloping wall that led down to what is known as Narcosis Valley. We had to watch our depth at this point, because the wall slopes so gently we could easily find ourselves slipping downwards. It was at this point that I heard my first whale-song underwater. No clue where the whale was - probably miles and miles away, seeing how far sound of that frequency travels underwater - but the song was a quiet, haunting melody that was just so very cool. No place for someone with fear of heights! The wall went straight down! 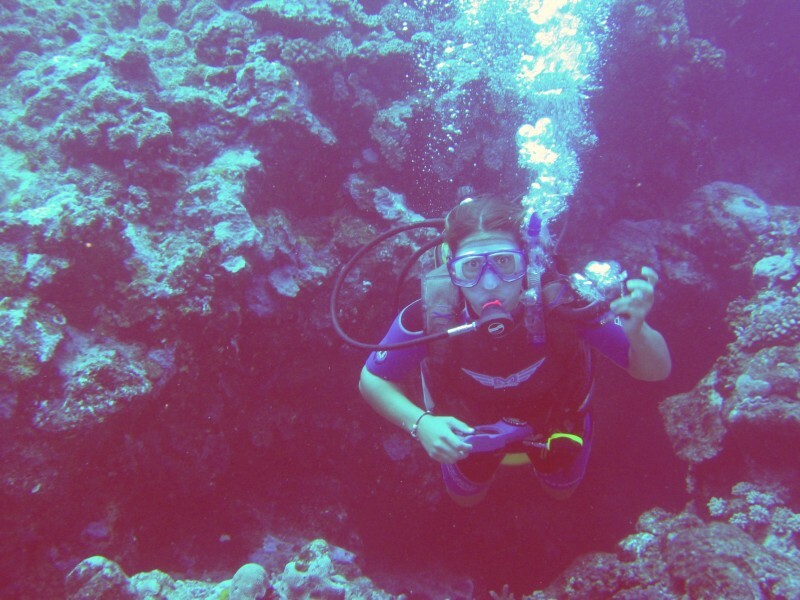 (Amanda) This is the last dive that I did in Tonga, and the last that I did for at least a month after, as well. I wasn't sure at first if it was worthy of being a last dive, seeing as we had already snorkeled in and around Swallows Cave. But it was probably that or somewhere I'd already dived (dove?). That wouldn't have killed me, but Swallows Cave really was nice. We started off in the cave proper, which is interesting and deep, but barren of life (because no sunlight gets in? Because the lip of the cave prevents polyps from coming in with the current?). After a little bit of hovering around (I love that feeling) as we re-found two of our divers, we went through a swim-through in the lip of the cave that I had never seen before - hey, you learn something new every day! The dive continued north(eastish) after that, past the second, smaller cave - we didn't actually see the entrance, seeing as it's about ten feet deep and we were around 55-60'. It was our second dive, so we restricted our depths a bit, but the truth was that the coral was nowhere near as good deeper down. The wall is nearly vertical, which produces an interesting feeling when you look straight down, into blue infinity. At some points I could see a ghost of the sandy bottom, but not very often - it leveled out at about 100', most places. Coral had had entirely too much fun growing on the wall, leaping off and arching in interesting shapes. There were overhangs, small caves, and lots of fish. Fishy fishy! (Sue) Amanda and I had the pleasure of this last dive in Tonga together, using a prize that Chris or Amanda won for participating in the yacht races. (Chris was out on a freebie whale trip.) I loved getting a chance to return to Swallow's Cave, but this time to dive. but the crinoids stay still! We snorkeled over the lip then descended into the dark of the cave (lots of air above us, not a "cave" dive!). The floor of the cave is dark and barren, but interesting for that reason. (There are stalactites and stalagmites up in the cave proper.) Our guide, Joe, gathered Amanda and me and a family of four and we took turns leaving the cave area via a swim-through in the outer wall that began at about 30' (9m), and exited into daylight at about 23' (7m) on the fabulous wall. Most of the interesting life was at about 40-50' (12-15m), perfect for the second dive of the day. The colorful crinoids waved from the crevasses and buttresses, and schools of triangle butterflyfishes and Moorish idols accompanied us.